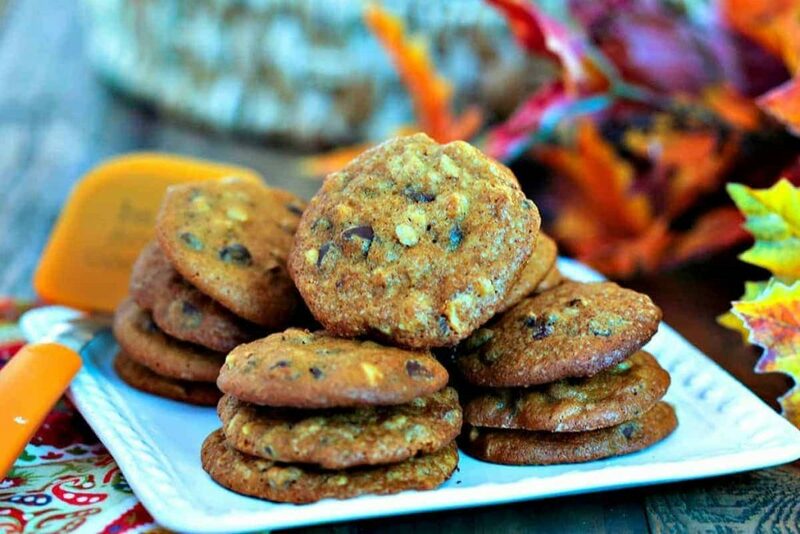 Pumpkin Chocolate Chip Cookies—light and airy pumpkin cookies chock full of chocolate chips and chopped hazelnuts—are perfect for Fall parties or tailgates! I don’t know about you, but I’m absolutely loving these crisp and cooler Fall mornings! With the onset of cooler weather and the beauty of the Fall colors, I can’t help but start craving all things pumpkin, even cookies! 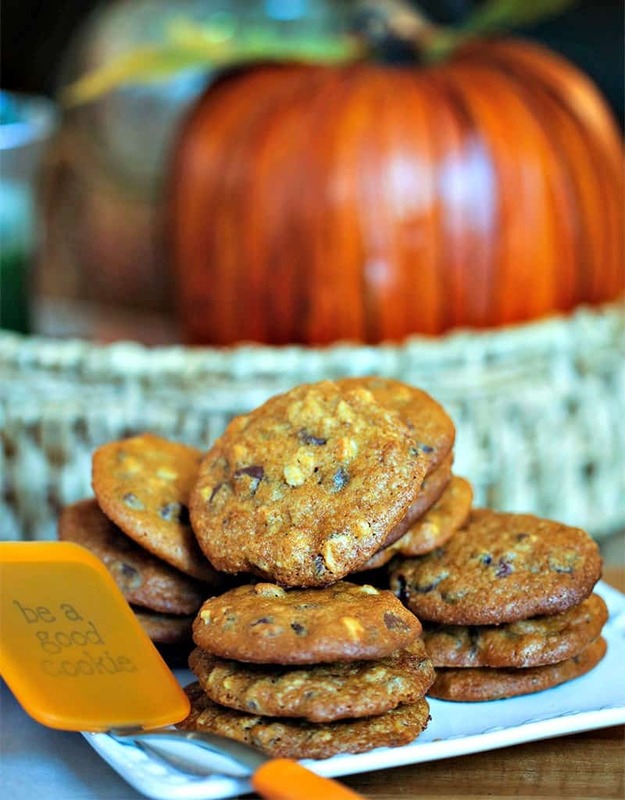 Today’s Pumpkin Chocolate Chip Cookies are light and airy pumpkin cookies chock full of chocolate chips and chopped hazelnuts. 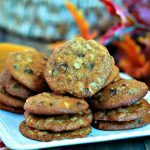 A single batch makes about four dozen cookies so there’s plenty to share and makes them a perfect dessert for Fall parties or tailgates! 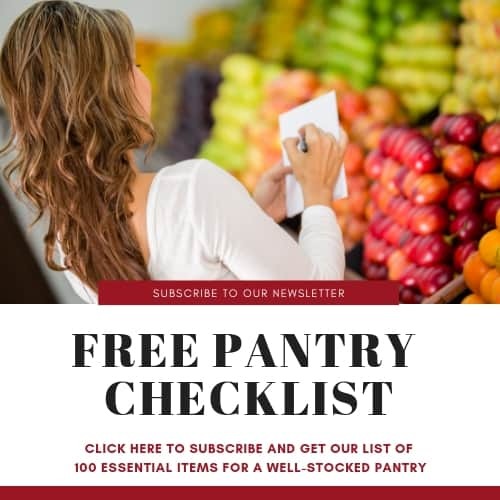 If you have trouble finding hazelnuts (they don’t seem to always be available at my local grocery), substituting walnuts or pecans works just as well. Or you can even skip the nuts all together and add an extra cup of chocolate chips. Either way, these cookies are delicious! 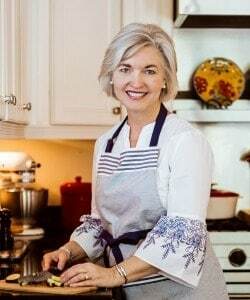 The original recipe was featured in The Ultimate Chocolate Cookie Book—along with my all-time favorite recipe for Chocolate Chunk Cookies—and suggested frosting the cookies with marshmallow fluff. I tried it out and although the iced cookies were yummy, I found them to be a bit too sweet and messy for my tastes. 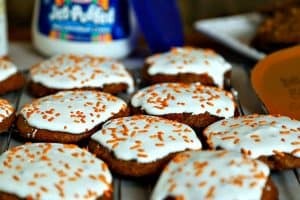 Once the cookies are frosted with the fluff, it’s best to eat them right away so that you don’t have to worry about how to store them as the fluff will not harden and allow you to stack the cookies. Personally, I like the cookies plain as there’s plenty of goodness without the extra fluff! Position racks in top and bottom of oven and preheat to 350 degrees. Prepare baking sheets by lightly coating with butter and a dusting of flour. In a medium bowl, whisk together the flour, baking soda, and spices; set aside. In a large mixing bowl, cream the butter with an electric mixer until softened. Add the brown sugar and granulated sugar and beat until light, but still grainy. Using a wooden spoon, fold in the flour mixture until incorporated. Don't overdo it so that the batter to becomes sticky. Gently stir in the chocolate chips and hazelnuts (or any other nuts). Drop by rounded tablespoons 2 inches apart onto the two baking sheets. Bake for 10 minutes—one on the top rack and one on the bottom rack—then switch the pans top to bottom and front to back. Continue baking 10-12 minutes until slightly browned. Cool on the baking sheets for 2 minutes before removing to wire racks. Continue baking additional batches until all the dough is used up.